In the next week, Disruptive Analysis will be publishing a major study into the viability of over 25 forms of "non-neutral" mobile broadband & Internet business models. Recent weeks have seen huge shifts around the concept of Net Neutrality - the FCC is about to reveal details of new proposals, while the European Parliament voted for a harder version of neutrality than many in the telecoms industry wanted. Lobbyists, activists and the wider telecoms and web industries are flooding the media and blog/twitterspheres with commentary, opinion and predictions of what might happen if Net Neutrality is/isn't enforced. Questions, rumours and myths about what may happen, if mysterious and vaguely-defined "Specialised Services" are permitted over broadband networks. Many observers have confused peering deals (eg Comcast/Netflix) with QoS-prioritised services, even though that is an entirely different issue. But while the principles get debated, a deeper set of questions are being overlooked. What are the possible outcomes for mobile network operators in a hypothetical world, where discrimination of data traffic on the basis of price or QoS is permitted? What are the realistic use-cases that might get applied? Who might pay for what services or capabilities? ... and the elephant in the room - are any of the non-neutral models actually viable anyway? Two years ago, Disruptive Analysis published a report giving 10 reasons why the concept of "toll-free apps" was virtually impossible to realise. Today, indeed, none exist. The conclusions were correct. Now, Disruptive Analysis is broadening its analysis to 6 main categories of "non-neutral" business model, and over 25 sub-types, identifying which has a chance of success, and which will face minor or major challenges. Blocked / impeded applications, "slow lanes"
Specialised services, or QoS-based "fast lanes"
One of the key themes is that new mobile data and Internet models are much harder to create than fixed non-neutral services. The realities of radio networks, device OS's, content/app consumption and policy/core infrastructure are hugely different and much more complex. There is also no legacy of "mobile TV & VoD" skewing the landscape, unlike fixed Pay-TV markets with both incumbent/integrated content players/distributors like cable MSOs, and popular "OTT" newcomers like Netflix. In addition, fixed broadband usually has no scope for arbitrage for the end-user. Homes only have one connection, unlike the role played by 3rd-party WiFi on wireless devices, which acts to keep the cellular operators "honest" and fair, up to a point. But despite that, some forms of "non-neutrality" do already work on 3G/4G networks, and others are likely to in the future, where permitted. While concerns about anti-competitive bundling may need to be considered in future, zero-rating of data for some apps or websites is becoming more prevalent, especially in developing economies. Facebook, Google and others are pitching basic zero-rated data apps, as a way for operators to entice low-end customers to take the first steps towards paying for dataplans. More interestingly, some operators are zero-rating resources such as Wikipedia or other education material - hard for neutrality activists to argue against. While sponsored data for apps is very challenging, other uses are more feasible, such as the use of paid traffic by advertisers - an idea invented by Disruptive Analysis in 2010. Indeed, while AT&T announced its "sponsored data" concept in January 2014, the only public sign of it so far has been free adverts for a brand of chocolate. Outside of the strict "Internet data" definition, we will also likely see priority-QoS applied to data used by emergency services on public 4G networks, and perhaps for certain M2M/IoT applications. We may also see differential charging and QoS applied to MVNOs, or integrated wholesale deals in the mould of the Amazon Kindle. More details on the conclusions and outputs of this study will be released when it is published. But clients who pre-order the report now, will benefit from a free 1-hour conference call about its findings. What is a "specialised service"? Can 2-sided business models work for mobile data? Which models are the easiest / most profitable / least controversial? Each of the 26 sub-categories has a table of analysis assessing its viability, based on the criteria shown in the example below. This draws on Disruptive Analysis' unique cross-silo understanding of service provider & application business models, network technology, device & OS architecture, developer/content provider motivation & user behaviour. The report will be published in the next week. An update (c20 pages) will be issued to purchasers around October/November. Pre-publication advance buyers will received a 1-hour free conference call to discuss the findings, at a mutually-convenient time. 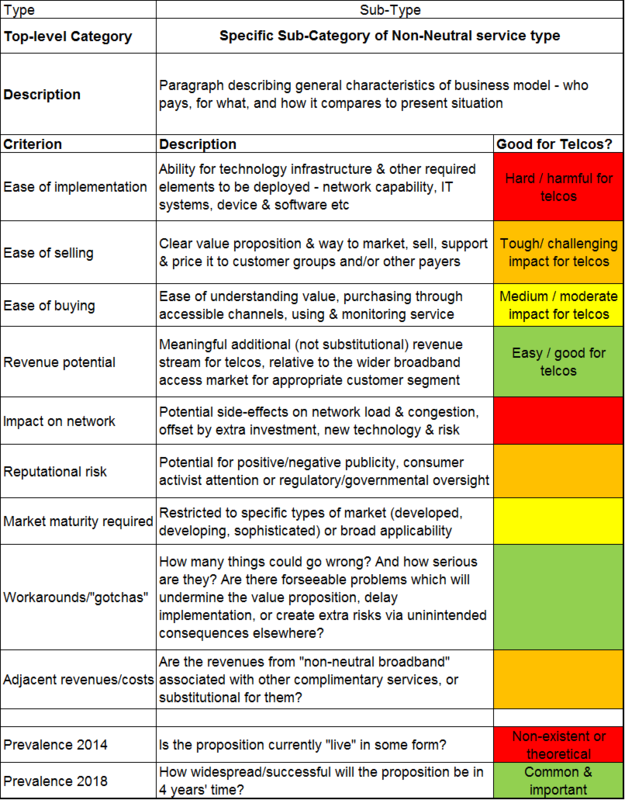 The Non-Neutral Mobile Broadband Business Models report can be ordered immediately via the Buy Now links below, or via information AT disruptive-analysis DOT com - payment accepted by credit card, Paypal and PO/invoice/bank transfer. For online purchasers, the PDF document will be sent by email, typically within 24hrs of receipt of payment, although sometimes travel schedules may mean a small delay. Please include company name for licence purposes, and VAT number for EU purchasers.